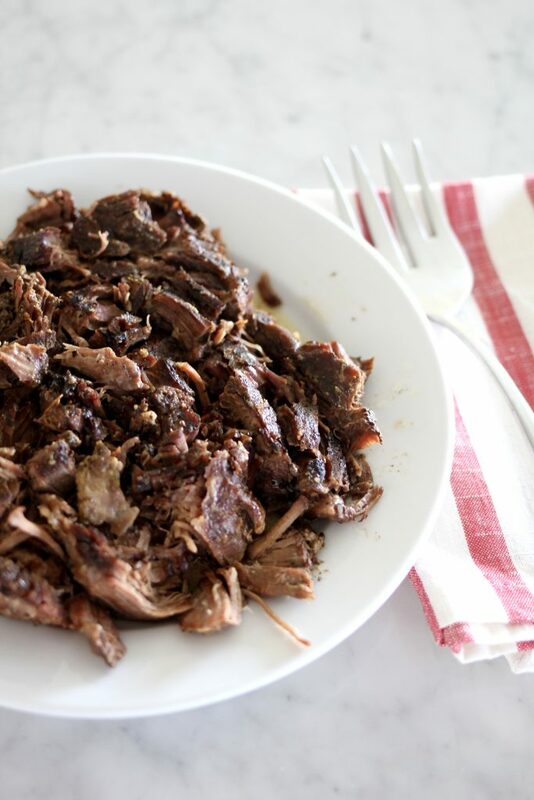 Everyone needs a simple, no fail recipe for slow cooked beef! 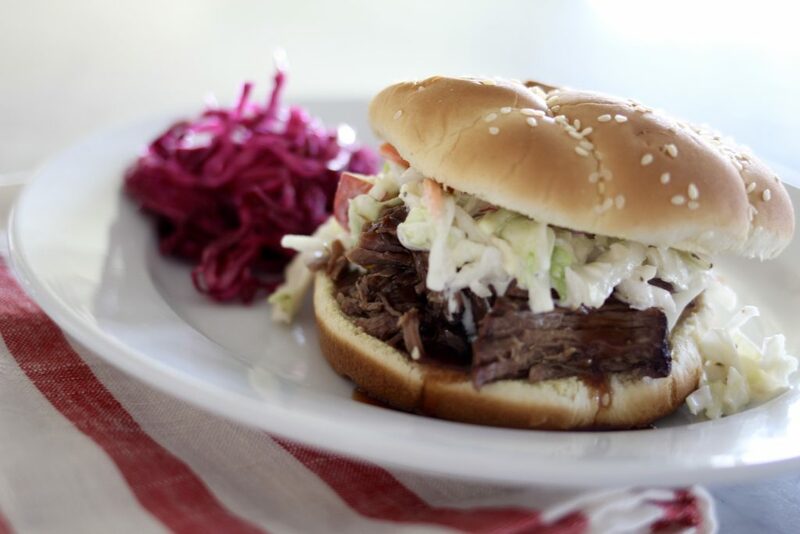 Slow Cooked Beef with Apple Cider BBQ Sauce & Pickled Purple Cabbage is a perfect filling for sandwiches, tacos, enchiladas or any other dish calling for tender cooked beef. No need to brown before throwing in the slow cooker. All you’ll need is beef, seasonings and a little water! For years, I experimented trying to get just the right formula for fork tender, fall apart beef roasts. I used beef broth, water, gravy mixes, soups, vegetables, you name it, I tried it. One time, the roast would turn out just right, the other, dry or overcooked. 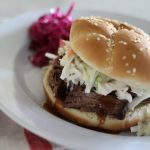 I wanted to find a fail proof way to cook beef for recipes such as tacos, enchiladas or simply to smother with bbq sauce and eat on a big soft bun! I have an amazing recipe for Family Favorite Pot Roast, but it’s geared toward a roast made with cooked veggies and served with mashed potatoes and gravy. This recipe is more of a stand alone method to cook beef when you just want to get the roast in the pot and not have to mess with a lot of prep or additional ingredients. Simple, basic slow cooked beef! 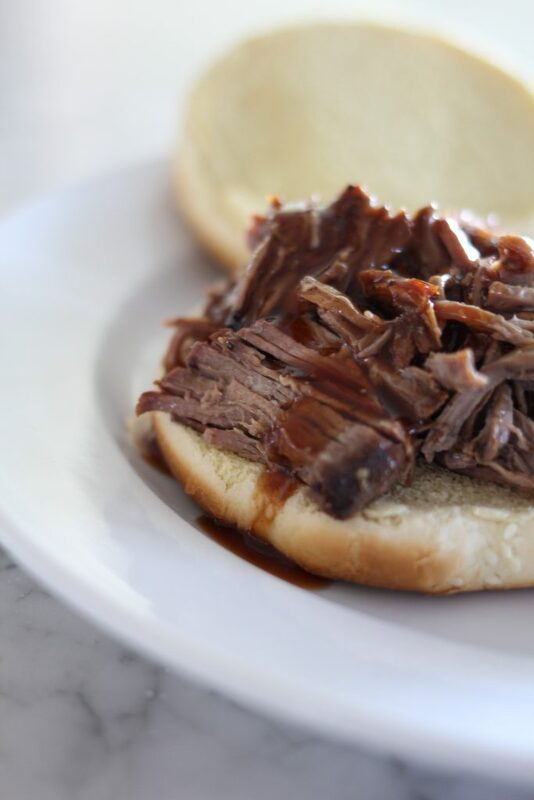 This recipe for Slow Cooked Beef on Buns is a one pot recipe. No browning required. If you want to brown the meat first, you are more than welcome to use a little olive oil in a pan and brown the roast on both sides before placing in the slow cooker, but it’s not necessary! That’s what I love about this recipe, it’s a one pot wonder, and it still gets plenty brown without pan searing ahead of time. 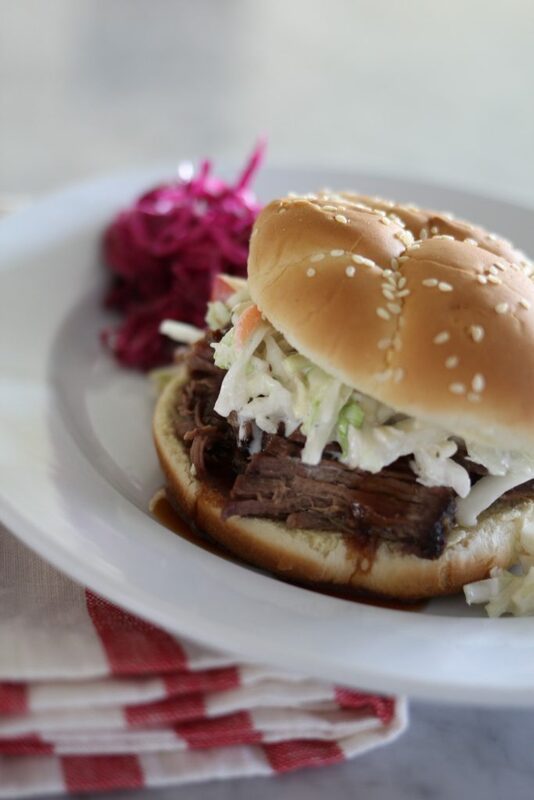 Grant is a big fan of heaping slaw onto his bbq sandwiches, so I always make our favorite Apple and Cabbage Slaw to go with Slow Cooked Beef on Buns . I wanted to add a bit of color and a little bit of tart to go along with the sweet slaw, so I made Pickled Purple Cabbage as well. I’m a big fan of different textures and colors on my plate. 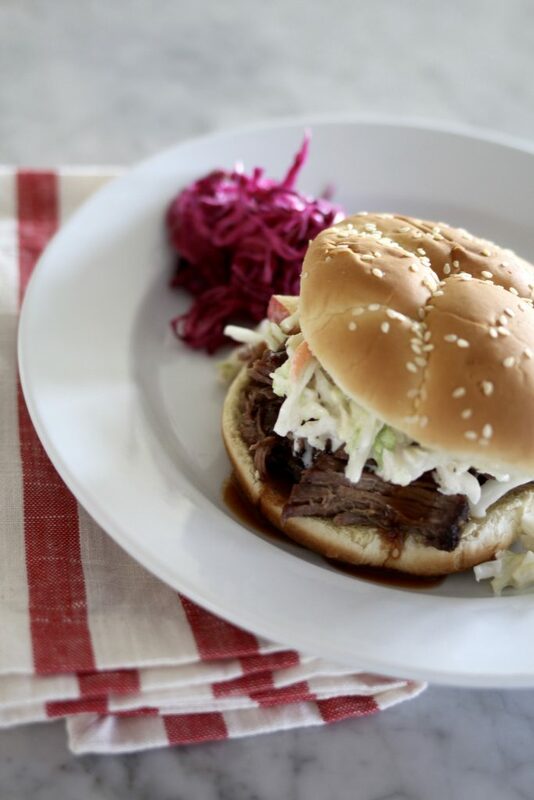 This pickled cabbage was the perfect condiment to the Slow Cooked Beef with Apple Cider BBQ Sauce, and it took about 2 minutes to mix up, so no big deal adding it to our meal! I know you’re going to love this recipe for busy fall days. Mix up the sauce and the cabbage in the morning. 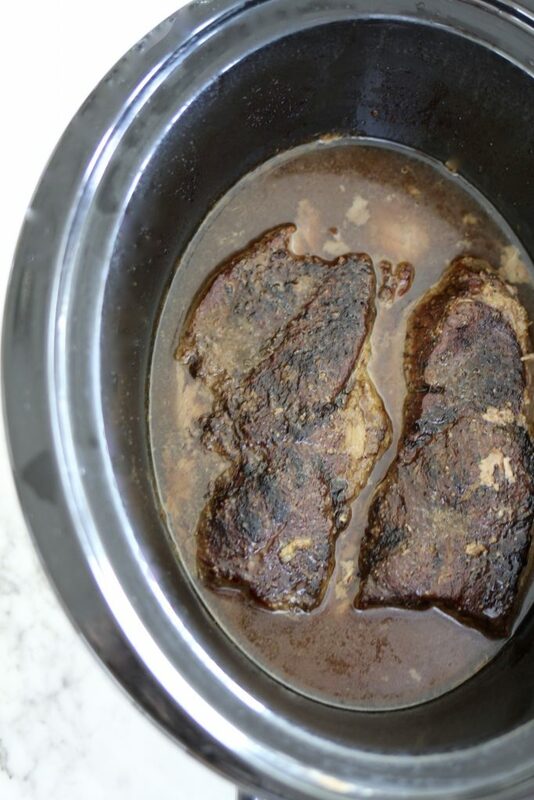 Throw the beef into the slow cooker and let it cook on low for a few hours. Then just turn it to warm and shred and eat when dinner time rolls around. Wouldn’t this be perfect for your Labor Day weekend bbq? Stay tuned I’m going to be posting several slow cooker meals for busy school days in the next few weeks! Lightly grease inside of slow cooker pan. Generously season roast on both sides with salt, pepper, and garlic salt. Rub into roast and place into slow cooker. Pour 1 cup of water around sides of roast. Place lid on pan and set to low. Cook for 5 hours on low, then turn to warm and leave on for an additional 3-4 hours. When roast is done, remove from slow cooker and place on a plate or pan. Shred with fork, remove any visible fat and discard. To keep warm, drain all but 1 cup of liquid and place shredded beef back into pot. Keep warm until ready to serve. Mix all sauce ingredients and heat in pan over medium heat. When mixture boils, turn to low and cook for about 15-20 minutes. Remove from heat. Store leftovers in refrigerator. You may also just mix all of the ingredients together and use without heating. Heating the sauce thickens it a bit and also helps the sugar to dissolve. Place cider vinegar and sugar into a medium size bowl. Whisk together until sugar is dissolved. 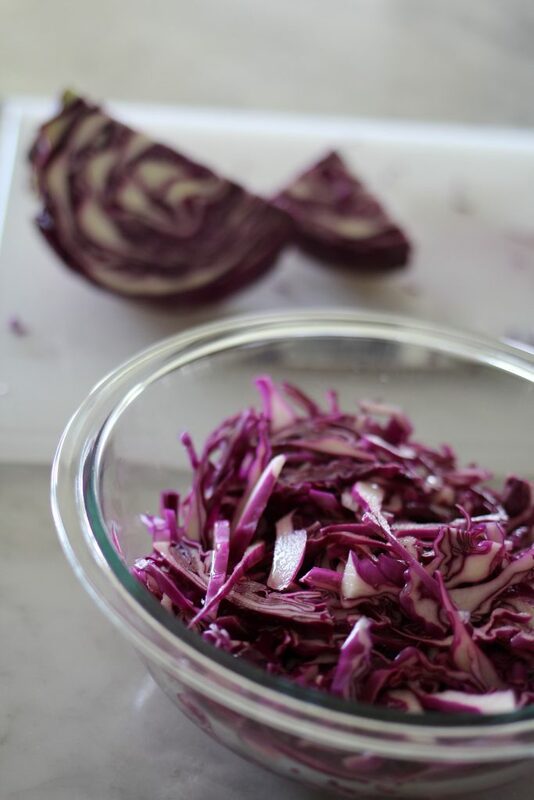 Place cabbage into bowl, sprinkle with salt. Fold together until mixed well. Or, place into a gallon Ziplock bag and turn bag a couple of times to make sure all of the cabbage is coated with vinegar mixture. Store in fridge. - I usually always cook two roasts. Any leftovers are used for enchiladas, quesadillas, tacos. -I purchase Chuck roasts. They will have marbling, or fat in the meat, this is what breaks down and produces a tender, fork tender meat. Low and slow is the best way to cook this meat. Look for meats labeled as Shoulder, Cross Rib Roast, Chuck Roast for best results. This recipe is NOT the best way to prepare brisket or flank steak. -You do not have to double the amount of water if you double the roasts. 1-1 1/2 cups of water will work. -If making ahead, cook the meat and store in refrigerator for up to 5 days before serving, you may also freeze the cooked meat. I store the meat in a 9x13 or large roaster pan. Make sure to place some of the water from the roast in the bottom of the pan. Remove from fridge and place on counter for about an hour before heating up. Place in oven, covered tightly with foil for about 2-3 hours at 225 or 1 hour at 300. Or pour meat back into slow cooker and heat on low for about 1 1/2 hours or warm setting for 2 hours. -Do not stir the meat, it will become mushy and the appearance will not be appealing. Thank you SO much for posting this! I have a crowd staying conference weekend at my home and I am constantly in the kitchen keeping everyone fed and happy. This meal looks delicious and stress free…love it! If I am making this roast to use in tacos do you still use the sauce on it? Looks yummy and so plan on making it this weekend. No I would leave the sauce off. I also have a great recipe for slow cooker pot roast, which might work out a little better for your tacos. Enjoy! How did you adapt this to the Instant Pot?